Wire-Haired Pointing Griffon, also known as a Slovakian Wire-Haired Pointing Griffons. The Wirehaired Pointing Griffon is a rare breed in the United States with very few puppies born each year. This dog's origin traces back to a famous Dutch breeder by the name of E. K. Korthals. He created the dog during the 1870's when crossing a German Griffon with a French Pointer. Spaniels and a Setter were also used as a means to finding a breed which would be perfect for hunting, with a keen sense of smell. The Griffon Club of America was born in 1916, although the dog has never truly taken off as a popular mainstream breed on this side of the Atlantic. 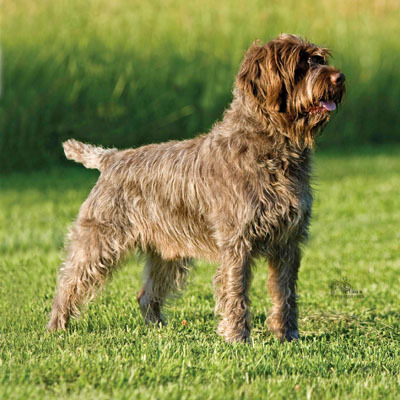 Controversy reigned when breeders attempted to merge the Cesky Fousek in to the Griffon family during the 80s, resulting in the founding of what is now known as the American Wirehaired Pointing Griffon Association - a group specifically designed to preserve the original Wirehaired type. Hunting was the original purpose behind the breed's conception. That is exactly what the Wirehaired Pointing Griffin now offers, although it remains most common in Europe where it was originally conceived. It is considered a French breed. The dog is still referred to as a Korthals Griffon in Europe. The Wirehaired Pointing Griffon alias applies only to North America. Developed after World War II this breed was crossed with the German Wire-Haired Pointer and Weimeraners and welcomed in Czechoslovakia. Great producers in all kinds of weather conditions, this hardy breed is used for both setting and pointing and very easy to handle. Switzerland has reached across it's borders choosing this breed for search and rescue work because of its talented nose. While considered to be a supreme gun dog it's popularity remains low. A great companion dog. •	Somewhat Hypo-Allergenic. Sheds less than most breeds. •	Great Hunting dog, versatile gun dog. •	Intelligent, eager to please, but reserved with strangers, but warms quickly. •	Requires a good run daily, has fairly high stamina. •	Devoted to it's owner. •	Medium to Large in Size. •	Has a history of hip dysplasia and ear problems. •	Webbed feet make this breed a strong swimmer. The Griffon possesses a double coat, which is usually a steely grey. It sometimes comes in a chestnut brown with white patches, and in rarer cares, all black coats have been noted. While the dog is relatively easy to train, and great to have around children, it can be nervous amongst unfamiliar faces and has a tendency to over-react when placed out of its comfort zone. Training well from an early age is the best way to rectify this problem, and thankfully, the dog is more than willing to learn with an inquisitive nature and good obedience. Generally speaking, the Wirehaired Pointing Griffin is a good - and fiercely protective - family pet, but it is most suited to the freedom of the outdoors. The breed is most famous for its capability as a gundog and tracker, where it excels at both. The dog is perfectly matched to hunters on foot and will retrieve in its own precise manner. They tend to stay within gun range and can be trained to follow orders to the tee. They are enthusiastic and love to hunt, with a keen eye for hares in the country. One of the great benefits of the dog's wiry and rough double-coat is that it makes the breed brilliant for hunting and adventuring in swampy conditions, or heavy marshland. The Wirehaired Pointing Griffin is well protected for all weather, and seems to thrive in the cold, damp. It is an excellent swimmer and will enjoy a local lake or river as a means to exercising and adventuring. The dog is affectionate around younger family members and is known to mix well with other pets. It rarely steps out of line, unless placed in situations with lots of unfamiliar faces and an unusual environment. When nervous, the Griffon can become snappy and distant - unwilling to engage, and less likely to follow orders despite its keenness to please. Indeed, the dog is only too willing to please and will work hard for your affection, without needing constant attention to stay content. A pat on the head or a quick ruffle is likely to send the easily satisfied Griffon buck wild with delight. While the breed is quite happy to be around family and makes for a great guard dog, it still requires a large amount of freedom and regular exercise. If kept inside or restricted, it is likely to become grouchy and unhappy. To get the most out of a Wirehaired Pointing Griffon, you really need to be able to appeal to its own needs. They are often marked out as a breed with the behavior of a pointer yet the attitude of a terrier; a rarity in the dog breeding landscape. The dog is blessed by its rough wiry coat and requires only a minimal amount of grooming, although you might want to apply some stripping and trimming where necessary for showing. With its shaggy fur and steel grey color, the dog is rarely considered high maintenance. It is renowned as an "untidy" dog with a messy complexion. Due to its energetic nature and love for hunting, however, the Griffon can come home looking slightly worse for wear with its harsh coat taking a battering in the countryside. Regular combing is advised to keep the coat looking healthy, and also to sift through the softer undercoat which is more likely to suffer with its lighter complex. Brush and comb the dog two or three times a week to maintain a healthy coat. It is also necessary to treat the Griffon's ears as neglect will result in a much increased chance of infection. Plucking the hairs inside the canal will reduce this chance. The plucking should be followed by a thorough clean, and carried out on a regular basis. The dog doesn't require the delicate attention of other breeds, but it is placed at a higher risk of injury and infection due to its roaming personality. The Griffon will shed tiny amounts of hair during the spring season, although some dogs have been known to shed none at all. When exhibiting for professional showing purposes, the dog requires equally minimal grooming. Trimming is only advisable around the ears, top of the head, cheeks and feet. The main body hair shouldn't be stripped in to any sense of pattern. The tail should replicate the body coat, without a plume. If the Griffon is being kept as a family pet, it is still recommended that he be taken for a professional grooming at least twice a year. The Griffon is not the sort of dog that can be left to its own devices and still be happy by the end of the day. It requires regular strenuous exercise to remain content and healthy. Neglect and lack of activity will quell its usually affectionate behavior. The Griffon will become moody and even depressed if it doesn't have the chance to burn off its steam. Apartment life will bore the dog quickly. It is suited to the great outdoors, and will happily exercise in just about any weather conditions, no matter how rainy or cold. The dog's rough coat gives it the freedom to explore wherever you choose to take it. It is also an excellent swimmer and will adore any chance to take to water. Similarly, the dog is just as athletic on foot and can be trained in to a wonderful running partner. Considered to be a medium speed dog, the Griffon moves in a graceful fashion. It has excellent coordination between its front and back legs. It isn't extremely fast, but always looks impressive on the run. The dog can cover a lot of land and is extremely powerful. There is no end to its energy reserves and it's rare that the dog will tire before you. The Griffon is widely considered to be one of the smartest hunting dogs around, possessing a desire to learn and a willingness to obey. It is well behaved and can be taught the basics at an early age, but the trainer must have a great deal of time. Marked with great intelligence, the dog has a quick mind and thinks fast. For all of the dog's obedience, it can become somewhat impatient if denied its love of the outdoors and regular exercise. Therefore it is important to meet the dog's needs before expecting it to meet your own. As a problem solver, the Griffon is more than capable although not in its element. But placed in a hunting environment, very few dogs can match the Griffon's ability to follow its master's orders while retaining a healthy independence. It can also be trained in to a running partner, or even a swimming companion in the local lake! In the home, the breed makes for an excellent guard dog with a high regard for the protection of the family. It is fiercely loyal and will stay true to its owner. It is eager to please and will work hard to gain your affection. This can be a hindrance if you need to correct them as they are slightly sensitive, especially when placed in an environment which isn't their own.